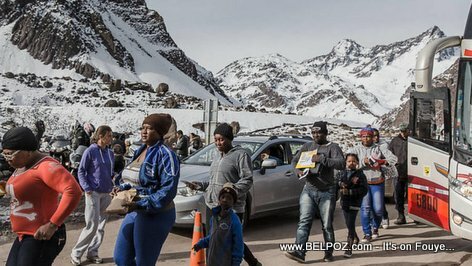 Here is a photo of a bunch of Haitians in Chile getting off a bus with a cold white snowy mountain in the background. Oh... How cold it must be for these tropical folks. Lots of Haitians migrated to Chile, a long, narrow country stretching along South America's western edge, looking for new opportunities. Some say nearly 1 percent of the Haitian population left and migrated to Chile.